The first sign of the zodiac, Aries, is attributed to those born between March 21 and April 20. Because it is the leader of the zodiac signs, those born under it are said to be bold and fearless. This matches well with the origin of the name from the Aries sign ruler Mars. This sun sign exists in the first 30 degrees of celestial longitude, and the Sun transits this constellation between the dates mentioned above. The symbol for Aries is the Ram, it is an element of fire, and it is a cardinal sign. Being ruled by the planet Mars, it’s clear where this sign gets its bravado as Mars was the god of war in Roman mythology. And in Greek mythology, the god of war was known as Ares. But the origins of the ram figure exist back even further to ancient Egyptian astronomy. Aries was associated with the god Amon-Ra, who was depicted as a man with a ram’s head. In Hellenistic astrology, Aries is associated with the golden ram of Greek mythology. The main star in the constellation, Hamal, comes from the Arabic phrase “head of the ram.” And the word Aries is Latin for Ram. The reason this sun sign is said to be first in the zodiac goes back to the Babylonian calendar from 7th century BC. They gave a month to each sign, beginning with the position of the sun in the vernal equinox, which at that time was depicted by the constellation Aries. The dates of the Aries astrology sign also fall within the spring equinox, which in many cultures represents new life and new beginnings. The other aspects of this sign, the fire element and the cardinal modality, have to do with how nature has been broken down into mathematical entities. The Egyptian Thoth sign corresponds to the Aries. There are four elements and three months in each season. Empedocles, a 5th century BC philosopher, also identified the elements earth, fire, water, and air. And the three modalities are cardinal (action), fixed (resistant to change) and mutable (adaptable). As the leader in the zodiac, the fire and cardinal sign Aries is seen as passionate and quick to act. Over the years, other personality traits have been assigned to Aries through various cultures. The anatomy associated with an Aries person is their head and face, and because of the ram symbol are often seen as going after something head-on. The horns of the ram have also been thought of as a cornucopia signifying abundance, which comes from the spring season where nature is coming back to life. Those born under the Aries star sign are seen as full of life and leading others into a new age. They enjoy a good challenge, and follow the god of war as being aggressive and competitive. You can find the corresponding Celtic astrology Alder tree meaning here. This kind of self-confidence leads them to be very independent, and just like the ram they rarely run with a pack. They are self-assured and sturdy and follow the ram’s instincts to go forward at any cost. And other things like color and metal have been attributed to all of the signs, and for Aries it is red and iron. Red follows the color of the Mars planet and iron is strong and durable. 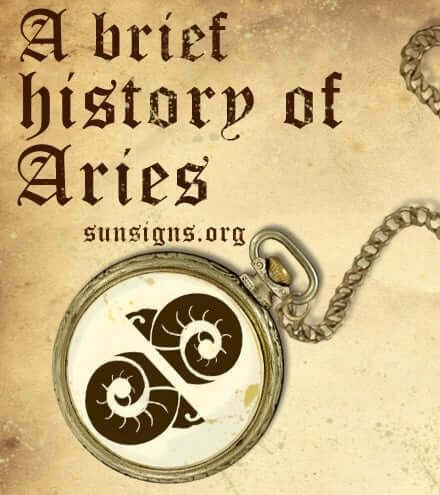 With such a history steeped in gallant and courageous symbolism, it’s clear why those born under the Aries horoscope sign are daring and adventurous.